This is the cliché beginning to all scary stories in English–the “Once upon a time” equivalent for scary stories, usually those with no happy ending. I started using this expression in my writing courses when we talk about reader expectations. Why this expression? Because some words are used together so commonly in English that you automatically fill them in, even before you read them. “Dark and stormy night” is a widely recognized example of this phenomenon. Google uses this same concept when it tries to guess what you are searching for and fills in the end of your phrase in the search box. If you’re interested in language learning, then you have probably heard that learning how words are commonly used together is a more effective technique for advanced learners than learning individual words. These are called collocations and they can be useful in writing as well. For example “dark” frequently goes with “night”, so we frequently hear “a dark night”. This collocation seems pretty self-evident. Because this is such a common expression, I expected the students to be able to guess the ending quickly and easily. It was a dark and stormy _______________. However, I was in for a surprise. Usually, at least one student in a group answers “day! It was a dark and stormy day!” in all seriousness. What I hadn’t considered is that some of the collocations we have in English aren’t necessarily as strong when you live in a place with an unusual climate. Where I’m from, dark goes with night and light/bright goes with day. During the day, the sun shines. 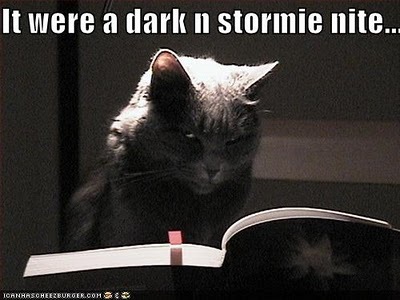 Here in the Netherlands, however, days are more frequently dark and stormy. For a Dutch student, a dark and stormy day makes perfect sense. For me, well, it is starting to make sense too!